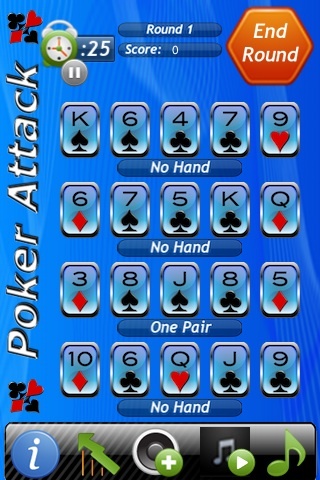 Take poker to the next level with the Poker Attack iPhone app. This is an extremely fun and addicting poker game that will have your fingers hurting when you are done with it because you won’t be able to put it down. Different than other poker games, Poker Attack puts you at a race against the clock to come up with the best hands possible in the shortest amount of time. You will have 4 different poker hands that you are customizing at the same time. You will have to fix them all up to your liking before the timer runs out. One of the great things about this poker app is the online connectivity that is involved. Because this is a point race against the clock, it can be really fun to see what kinds of scores other poker players are getting and then try to go back and beat it. You can upload your personal scores and shoot for the top! This app will keep you flying through the rounds trying to create the best hand possible. This poker app is a bit more action packed and fast paced than other poker apps and it helps to set it apart. For only a dollar it is a fun poker spinoff that you will probably enjoy. Voted 4 1/2 stars by iPhone app users and currently costs $0.99 to download.